Factionalism came to the fore during the Youth Congress Sankalp rally at Sarkaghat in Mandi today as senior leader of the area Rangila Ram Rao and his supporters deliberately skipped the rally. The political show was organised by Youth Congress to show its strength in the area, where general secretary Yadupati Thakur is considered a strong contender of the party ticket against former Cabinet Minister Rangila Ram Rao in the coming days. The tussle between the duo grew intense last year when Yadupati was expelled by the Himachal Pradesh Congress Committee (HPCC) after the Block Congress Committee passed a disciplinary action against him and alleged that he had shown black badges to Rangila Ram Rao during his visit to the area. 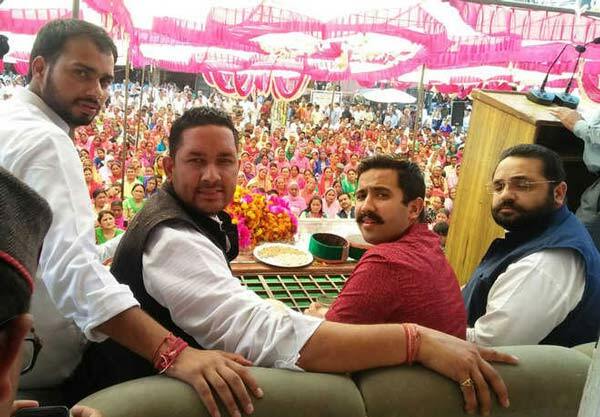 Yadupati is considered a close aide of Youth Congress president Vikramaditya Singh, son of Chief Minister Virbhadra Singh. At present, Yadupati’s return into Congress is under HPCC’s consideration. The crowd was pulled by Yadupati Thakur to show his strength at Sarkaghat, where former Chief Minister and BJP leader Prem Kumar Dhumal also addressed a rally few days ago. Yadupati Thakur, while addressing the gathering, said the area lacked basic facilities, such as better road connectivity and potable water. He demanded that a campus of the proposed medical university at Mandi should be opened at Sarkaghat to facilitate the people of area. Vikramaditya Singh presided over the Sankalp rally and encouraged party workers to work hard for the win of the party in coming days. He said the BJP was trying to divide people on basis of cast and religion, while the Congress believed in equal development without any bias. He targeted Prem Kumar Dhumal for opposing Dharamsala as the second state capital.Vikramaditya praised the efforts of the state government and said during Congress regime, several steps had been taken to benefit the masses and create job opportunities for the youth of the state. Skill development allowances were being provided to the youth to make them competent to find a job, he added.